I read a lot of books on business, sales, and success. I love motivational books and yes, even self-help. Why? Because so much of success is mental. Study the sports greats and the practice on the field is only one component of their overall performance. The truly great players spend countless hours getting their head right. And this makes sense if we think about it. Take a horse for example. No matter how large that beast is, man can control the direction that animal goes with ONE thing…controlling the head. Where the head goes the rest will follow. Granted, there are days, I don’t know if I could find my head. I have been down with a really bad cold for a week and I think I finally found my head in the couch cushions all sticky and plastered in dust bunnies and Cheerios. I am all over the place this morning, still foggy with cold medicine. And guess what? That is okay…so long as I get my head cleaned off and put back on straight. This is not an activity we do ONCE. Life is not static. At times? Our head WILL fly off the wrong direction. It is just up to us to be aware of the fact that it needs to be put back right. See we need to have a different kind of self-awareness when we decide to go pro at anything. We can’t afford the mindlessness of mediocrity. We can’t afford day after day of being reactive and permitting life to happen TO us. We need to get our heads on straight. Now, to do this, we have to adopt habits that are very different to the rest of the world and that might even seen a bit strange. And guess what? They are strange! Habits of the 5%ers are GOING to seem odd to regular people. Being excellent is going to force us where it is uncomfortable. In fact, the more uncomfortable it is, the better the results. Our subconscious mind dictates our unconscious habits. The mind and the body are connected and we need to appreciate this fact or we are doomed to self-defeating behaviors. This is one of the reasons my left eye twitches when people declare they are “aspiring writers.” Go look up synonyms for “aspiring” and you will see words like “wishful” or “trying” or “longing” and so is it any wonder that writers groups across the world are filled with aspiring writers who never finish (let alone publish) anything? When we declare we are professionals, then our subconscious will 1) match our behavior with our words and/or 2) convict us when our behavior is out of line with what we have declared to be true. We will get that niggling sinking feeling when we don’t do our job. But guess what? Keep acting like a pro long enough and people see us as a pro and so guess who gets the paying work? I keep a notepad where I constantly write things that are untrue and it has been shocking to me over the years how often reality has caught up with what I might have written off as a pipe-dream if I hadn’t known this trick. I am the definitive voice in branding and social media for authors. I didn’t even have a book finished. Now? 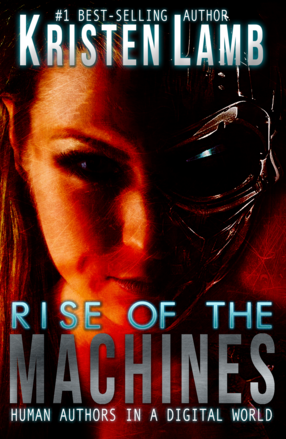 I’ve written three and Rise of the Machines—Human Authors in a Digital World is the definitive guide for branding for authors. I had a goal of writing a branding and social media book that would be evergreen and was told it was impossible. Well, yeah about that 😉 . I am regularly invited to speak at conferences. Then it happened. So I wrote something SO unrealistically big I erased it four times before I finally left it. I am the keynote for the Romance Writers of New Zealand. Guess where I am keynoting in August? I have 55,000 subscribers to my blog. Looking back? Maybe should have dreamed bigger but I wrote that when my mom was my only fan. My writing heroes come to ME for advice. And this still freaks me out when they do, LOL. Was this some sort of hoo-doo-voo-doo magic? Not really. It was getting my head on straight and focused on where I wanted to go. I listed out the habits and behaviors I needed to support these assertions. I blogged week after week after week even when no one read and there was no evidence to support what I had declared to be true. This doesn’t mean I just kept posting crap. No, I studied other blogs, read books, read articles, asked questions, tried new things and above all I was consistent. Then once I reached my goals, I didn’t remain there. I dreamed bigger dreams, different dreams. Now that social media has become part of our culture as I once envisioned, and I have provided the ONE manual necessary for owning that space. I’ve adjusted my goals back to fiction. I am a #1 New York Times Best-Selling Author. I am a #1 USA Today Best-Selling Author. Is it true? Not yet 😀 . But guess what? If I keep declaring this it holds me accountable to WRITE THE BOOKS. I can’t become a best-selling anything with NO BOOKS. And since I want to hit these lists, not only do I have to write the books (finish the books), I also am wise to study what sells. When I am not writing, I am very literally reading the best-seller lists. I have made my MISSION from these declarations. So even though I might look silly to you claiming, I am a #1 NYTBSA! don’t you think my odds are vastly different because I have claimed this then adopted the behaviors of someone obsessed with this goal? I see so many writers out there focused on all the wrong things and they are psyching themselves out. Remember if we declare it to be true then it will be. There is too much competition. My book can possibly be seen. People just don’t read anymore. No one makes money writing books anymore. At least I can do this as a hobby. I know when people like me start talking about the power of the mind, folks start rolling their eyes but tell me this. When did you ever see a sports superstar who declared, I am the best basketball player in the world who then became successful without shooting any hoops? You know, he wrote out affirmations and went to positive thinking camps and watched inspiring movies and never had to get on the court but he still rose to become an MVP? Yeah hadn’t heard of him either. Hell, I am depressing myself just writing that. Being a successful writer has a lot of moving parts and is not for the faint of heart. But declare what is untrue until it becomes true. Align your actions with your mission. Yeah discoverability is a nightmare, so learn how to do social media, how to build a brand, how to do what it takes to overcome the odds. Hey, I got sick and had to move up the dates for two of my social media classes, so sign up and let me help you! In the meantime, just say…. People might not read books, but they DO read MINE 😀 . What are your thoughts? Do you find yourself getting off track? Focused on all the wrong things and bogging your spirit down? Do you find yourself talking about all the things you aren’t instead of what you could be? Do you feel strange declaring success? Heck, I do. Feel like a loon. It’s okay to be crazy here. Do you find it easier to believe all the bad? Have you overcome being your own worst enemy/critic? But I would be lying if I said I didn’t have mixed emotions. By 2006, novelists were dying due to the predatory practices of mega-bookstores like Borders and Barnes & Noble (for more on why, go HERE). These businesses had made next to impossible for novelists to make a living wage. Their methods obliterated the author middle class and replaced a balanced economy with a Publishing Third World where most of the wealth was concentrated at the top with the super well-known brands. The reason is that, to offer so many books so deeply discounted, books had a far shorter shelf life. Also, unlike say a B. Dalton, the mega stores didn’t carry backlist so a mid-list author was no longer making royalties off eight or ten or fifteen books, she was making royalties off of ONE. The backlist was pulled and essentially stuffed in storage. The problem was that how platforms were traditionally built was by an author being able to offer multiple titles. Without multiple titles in circulation? Platforms dissolved or never formed at all. If you were a new author, you had to hope for a proper alignment of stars and hope the book took off and made impact like a literary meteor strike. Because, if you didn’t? There was no good way to keep fan fires burning because older titles got pulled. I saw that it was now going to be possible for an emerging writer to cultivate an audience and fan base before the first book was ever published much the same way non-fiction authors could do. Additionally, authors now had a way to offer interaction and content with fans between books. When Amazon, Smash Words, etc. entered the scene with e-books? The future got brighter. Mid-list authors who were leaving publishing in defeat now could take that backlist and put it out with new life and power this engine using social media. Not only could they build and maintain a brand and platform with social interaction on, say, Twitter or Facebook, but they were back to having those multiple titles SO critical for any brand. Authors who’d been driven practically into poverty now were making incomes unlike anything they’d seen before. Before sites like Amazon, writers had two choices. Legacy press or the pay-to-play vanity press. But the steep cost of vanity press acted as a sort of gatekeeper. Also, without social media, vanity press was pretty much a sure way to end up with $10,000 worth of books in our garage. This meant that 1) bad books never really made it into circulation and 2) writers had time to learn and grow and mature before their book was good enough to be accepted by a legacy press. Granted, I am not saying everything NY accepted was great literature. Nor am I saying they didn’t reject some amazing works because of their business model. But, I think I am fairly safe saying that writers who had no plot (I mean NO plot), poor grammar and atrocious spelling likely didn’t make the cut. So places like Amazon have been wonderful and have given us gems like Wool and The Martian and it has given new life to old series we wouldn’t have been able to buy unless we struck gold at a garage sale or used bookstore. Even I have benefitted greatly. NY didn’t want a social media branding book. Even though they were insisting every one of their authors BE on social media, they refused to publish the manual on HOW to do it well. Yeah, I know. Go fig. But Rise of the Machines—Human Authors in a Digital World would have been impossible without self-pub and writers would have had to figure everything out the hard way. But one of the reasons I was not fully gung-ho on self-publishing is that I also saw it was going to bring a LOT of problems. The slush pile would be dumped in the reader’s lap and it would devalue what it meant to say, “I am a published author.” And, by giving any person who’d finished a book the title of “published author” it was going to be harder and harder to correct bad writing. You guys know I am all about writers being supportive of each other. We have a tough job and we already endure friends, family and the world knifing us, we don’t need to be doing it to each other. I have always had a policy on doing book reviews. If I can’t leave at least three stars, I don’t say anything at all. We are drowning in a sea of participation trophies and this is problematic not only for readers, it is devastating to the writing community. Writers who were in no way ready to be published are, but because they are “published” this makes it all but impossible to offer meaningful correction so they can actually grow. By remaining silent, the author is given no meaningful feedback on how to get any better so the author is just going to keep putting out bad books only making the problem worse. Thank GOD it was before Amazon. Then because the writer now is an “author” they are far harder to correct. I have had folks who have won my 20 page critique who sent in writing so bad I could barely make it through. When I red-penned it, I got ripped on how the work was already published and had “great reviews” (All my friends and family LOVE me so you are an idiot). We are seeing real problems with the millennial generation, and reaping the consequences of handing out participation trophies, banning any failed grades and making teachers use blue pens for grading because “red ink hurts feelings”. We have young people who are bright and passionate and who want to change the world, but they are vastly unrealistic and virtually impossible to correct. What is happening is that our intelligent and idealistic youth are suffering unprecedented rates of depression and they are giving up before they should, all because the world doesn’t match their skewed world view. We all are suffering because these kids DO have a tremendous amount to offer, but have been knee-capped by misguided benevolence. They were not allowed to fail. And by not being allowed to fail, we stole the joy of authentic success. We devalued those who’d earned success. Failure is the best teacher. Humans are wired to learn from failure. And while that is a whole other blog altogether, I am seeing what I feared back in 2004 happening to the writing world. The same crisis facing our millennials is devastating our writers. We have created Generation Author Snowflake. A title that once meant something is open to anyone with a computer. Not only does this discourage writers who did the hard work by handing rewards to those who skipped key parts, but it gives many writers a skewed sense of their abilities. Because failure has been removed from the equation, many writers keep putting out books that aren’t any better than the first bad book that really wasn’t ready to begin with. I frequently tell writers the key to success is multiple titles (like above) but this is assuming the author is putting out quality material people want to read. Simply writing book after book with no plot or one-dimensional characters is only padding a virtual slush pile. Additionally, benchmarks of success have been devalued. Years ago, there was a writer in my old writing group whose writing was SO horrible we felt like we were hostages, not critique partners. He never took a single suggestion even though we endured that terrible book for 18 months. When he invited me to his “book signing” at Barnes & Noble? I died a little inside. To this day a “book signing” means less because of this. But it gets worse. Because we really don’t want to hurt feelings or suffer a backlash, those of us who might actually help a writer grow remain quiet. I recently tried to read a book that was unbelievably bad. But the author was popular, so I guess that is all that matters, right? If I wrote the scathing review the book deserved, then I am a jerk for publicly stabbing another writer (and risk tanking my brand for “being mean”). If I write an e-mail, then that would likely fall flat because so many others said the book was better than unicorn tears. But if I remain quiet, who really suffers? One, the reader for being recommended a 5-star book that hardly earned the rating and for more reasons than simple subjective taste (no plot, repetitive words, bizarre body movements, flawed facts, etc). But the author never grows because the social media echo chamber of popularity is offering a distorted reality. In the end, I have no good answer. I still can’t bring myself to write bad reviews but then am I contributing to Generation Author Snowflake? This book is awful! Kristen, what do I do? But this is the reason behind my post. One of the great benefits of social media is the hive mind. I am only so smart, can only have so many answers. But with you guys? Maybe we can figure out how to change things because I want to get better. I don’t want to get trolled, but I don’t want sunshine blown up my skirt, either. I want to believe I earned what I got and I don’t think I am alone. I am so thrilled we have all the advantages of e-books and Amazon and blogs and social media. But there are some serious consequences we need to address and correct. Writers are getting discouraged and giving up. Their careers are lacking meaning and they feel like failures, much like the millennials who have corners filled with ribbons and medals they know they didn’t earn (but with no authentic feedback how to improve). Maybe they really DO have talent, but because they have no correction it really never develops. Or, sad to say, maybe they just aren’t good writers and they need to treat writing as a hobby and stop hemorrhaging money in marketing because they lack what it takes to do this as a career. No matter what way I look at it, this is bad. It need to change. So what are your thoughts? Do you have writers around you who are less open to feedback because they are “published”? Do you struggle with reviews? Do you have any ideas or thoughts or suggestions? How do you handle it when a friend has a book that really wasn’t yet ready to be published? Do you find that old benchmarks mean less? Do book signings or book launches fall a bit flatter for you? Do your real successes mean less than they might have 15 years ago?